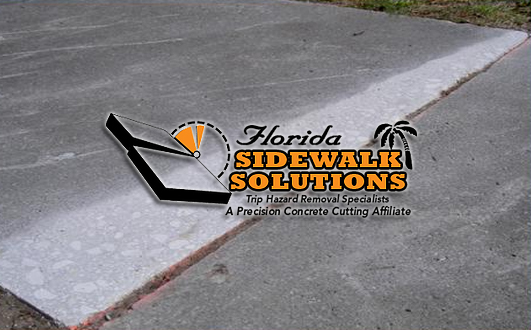 When your property requires you to repair concrete sidewalk uneven it is important for you to act quickly. An uneven sidewalk that is not repaired can continue to get worst costing you more in the long run. Furthermore, keeping your concrete sidewalk in good condition is important to ensure the safety of anyone walking along the path. 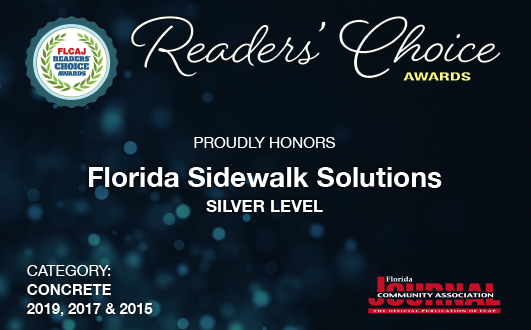 In South Florida, the best choice for repairing an uneven or damaged sidewalk is clear. 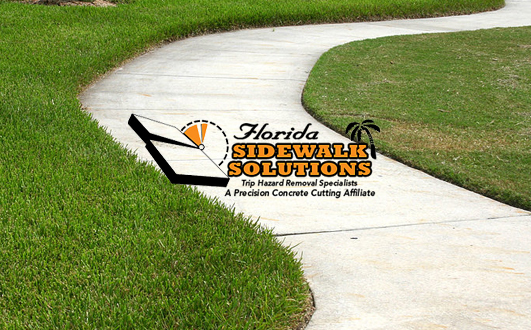 Florida Sidewalk Solutions can deliver customers with quick, affordable, and be as minimally disrupting to your property as possible. 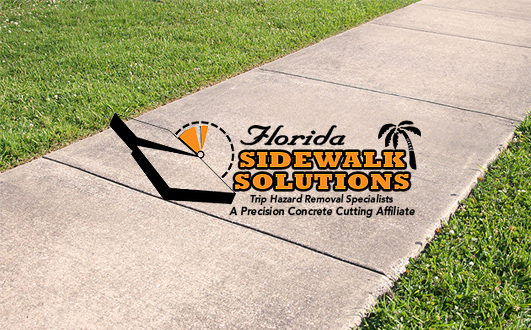 Using the innovative method of concrete cutting Florida Sidewalk Solutions can ensure you the best uneven sidewalk concrete repair service you can count on. The following article explains how a sidewalk can become uneven over time becoming a major trip hazard and why it is so important to repair them when this happens. 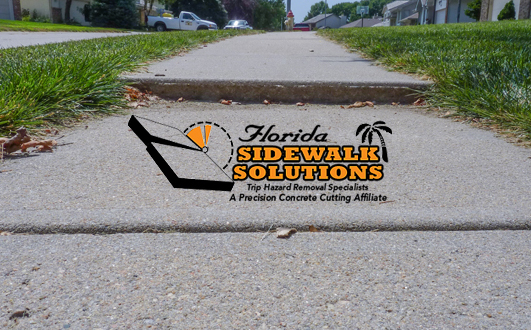 If you are ready to receive a free estimate for the cost of removing trip hazards on your property’s concrete sidewalk then contact Florida Sidewalk Solutions today. Soil is in a state of constant fluctuation and change which means the concrete sidewalk sitting on top of it must contend with soil expansion and contraction. 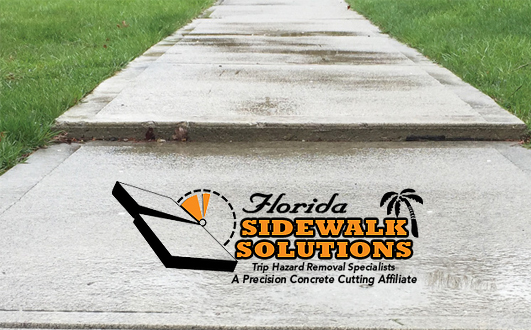 Concrete sidewalk is also exposed to the environment and often times extreme temperatures like those found in South Florida. The constant fluctuation of the concrete causes tiny cracks to form which can allow water and other liquids to flow into the subbase of the concrete. 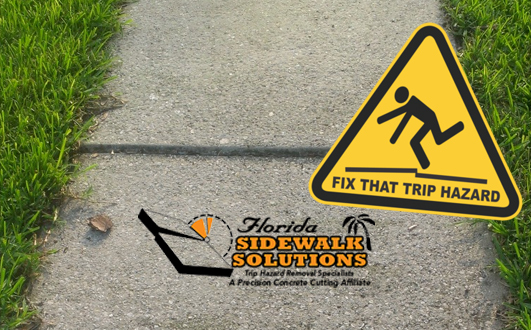 The cracks continue to expand and if the issue is not fixed will cause you to require to repair uneven concrete sidewalk on your property. 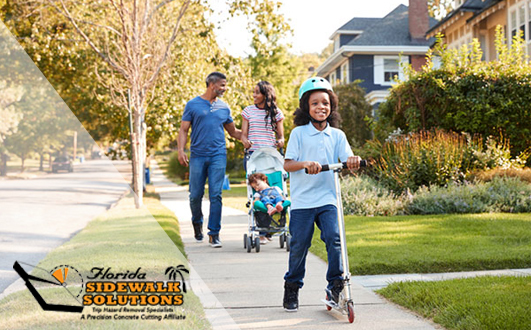 Besides weather and temperature changes there are other environmental factors that concrete sidewalks can be damaged by. 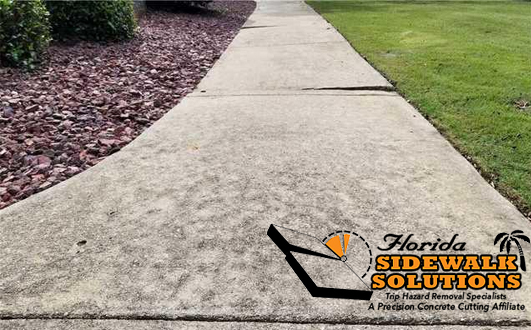 These factors include heavy rain, chemicals, and tree roots which can all contribute to damaging your concrete sidewalk. 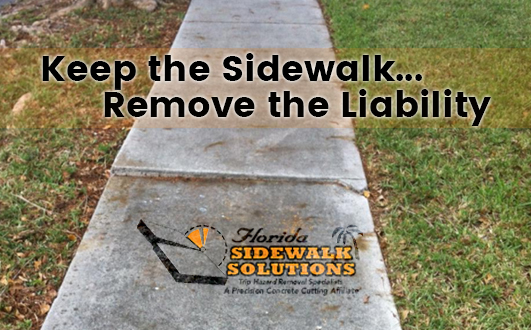 A damaged concrete sidewalk may initially seem like nothing more than a cosmetic nuisance but over time can become a costly issue if not repaired quickly and competently. 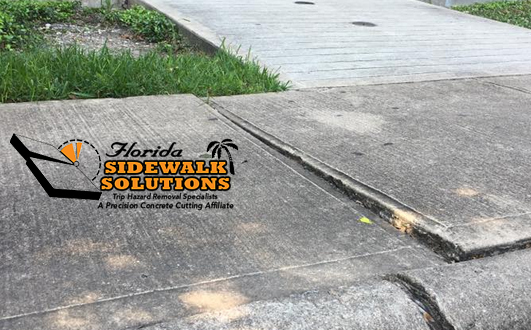 An uneven sidewalk poses a major liability for property owners, HOAs, and business owners who are responsible for the condition of their concrete sidewalk. A trip hazard from an uneven sidewalk poses a major safety issue for persons with disabilities, young children, and the elderly. As a property owner, you are responsible for being in compliance with the Americans with Disabilities Act (ADA). 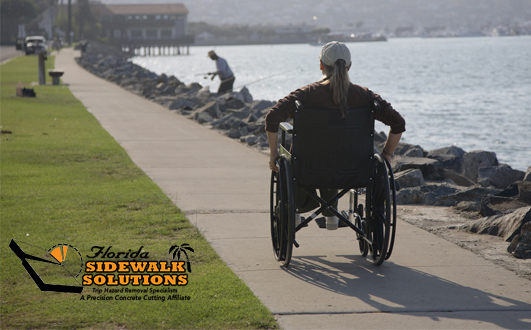 The ADA defines a trip hazard as any slope caused by cracks or joints in the concrete that exceeds a 1/4th inch. 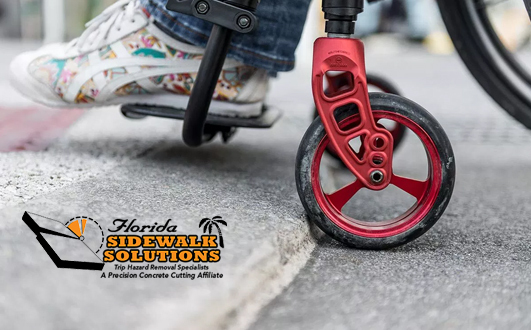 Failing to follow the ADA could cost you thousands in fines and open your property up to liability lawsuits from injuries all of which are far more expensive than choosing to repair uneven concrete sidewalk for your business.